For curry sauce, whisk together 1 can lite coconut milk + 3T red curry sauce + ¼c coconut aminos + 1T apple cider vinegar. Peel & roughly chop 2 onions. 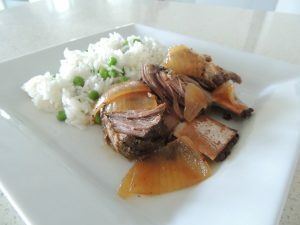 Place chopped onion, 2# short ribs & curry sauce into a slow cooker & cook over low for 10-12 hours (or high for 5-6 hr).